I'm excited by David Sifry's new HoosGot system. It is a simple idea which ought to be robust to feature creep. That being said, while there seems to be a reasonable rate of hoosgots being posted, the number of comments that are being submitted in response appears to be low (are people simply responding directly back to the authors?) So, I'd like to be able to see at least a ranking of hoosgots by the number of responses on the site. 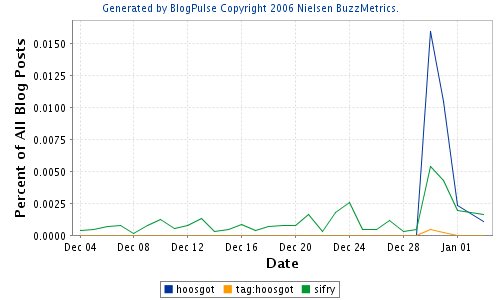 Even better would be a ranking of hoosgots by the number of click-throughs to the original poster where possible (e.g. with blog posts).